It is always our goal to provide a high level of service for our customers and the many General Contractors we work so closely with every day. This is why acousticalwallfabric.com maintains a list of Acoustical Contractors, Painters, Wallpaper Hangers, and Wall Finishing Companies throughout the US who specialize in Acoustical Treatments, Soundproofing and the installation of Stretched-Fabric Wall Systems. Start receiving RFP’s & Invitations to Bid on qualified acoustical and tackable wall projects. Companies who register with us will also be provided with manufacturer certified job leads and the contact information for Customers in your area who have contacted us with a need for Acoustical Treatments or Tackable Fabric-Wall Panels. Registering your company is easy and takes only minutes so let us help you grow your business by providing you with qualified project leads in your area. 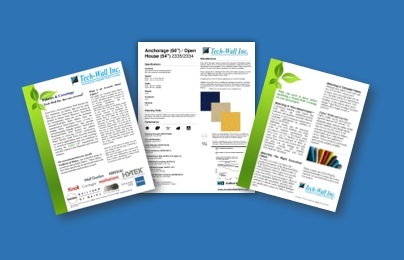 A wide range of marketing materials are available for the qualified and registered contractor who actively purchases from acousticalwallfabric.com and installs a Tech-Wall Stretched-Fabric Wall System.